Happy Bloggers Challenge Friday! Thanks to those who played along with the Give Thanks Challenge, the challenge this week is a Color Challenge - use Red, White/Vanilla and Blue on your projects (additional neutrals can be added if needed). I used one of my favorite images from the Artistic Outpost Hero stamp set along with pattern paper from Bo Bunny to create my card. The image is stamped in Black Archival Ink on scraps of the pattern paper, then cut from the frame, sponged with Ranger Gathered Twigs Distress Ink and adhered to the pattern paper panel so his arm is a bit "out of the box". Love your Hero! Fabulous take on the challenge and layout! Cute card! 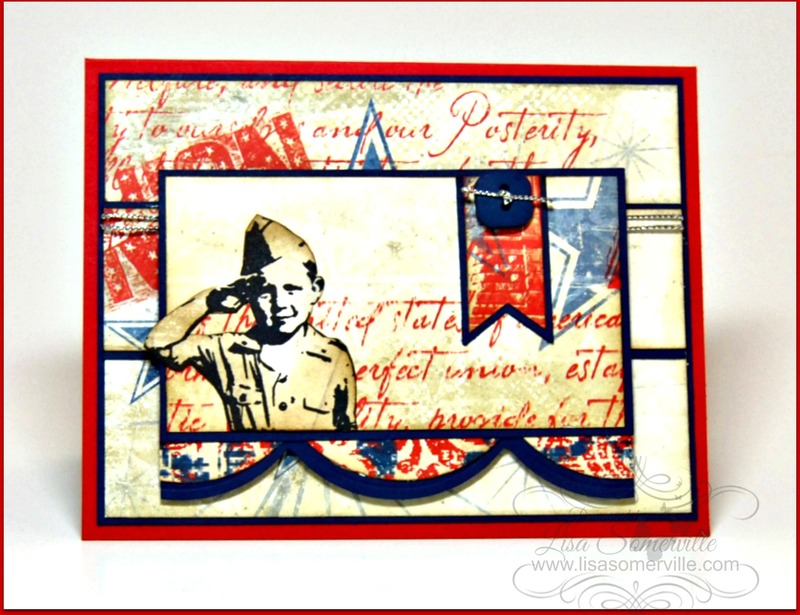 I may do something similar for a Veteran's Day card. Great patriotic design! Love how the elbow extends beyond the edges of the image panel.